The new General Manager, Corporate and Strategic Communications Division of the Nigerian Ports Authority (NPA), Alhaji Aliyu Abdullahi Goje has assumed duties. Goje was the General Manager, Eastern Zone of the Authority but deployed to the Division recently following the scrapping of the Zonal structure. 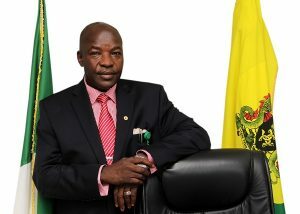 A seasoned Port Administrator, Goje began his Civil Service career with the Borno State Government as Land Officer in the Ministry of Land and Survey shortly after his mandatory National Youth Service Corps (NYSC) assignment in 1983 and rose to the rank of Deputy Director in charge of Land Administration in 1992. The new image maker transferred his service to Nigerian Ports Authority, in August 1993 as Traffic Manager and has since managed the Traffic Department effectively. He has been senior Traffic Manager in Lagos Port Complex, Assistant General Manager at both Eastern and Western Zones, Port Manager Onne Port Complex, among others. The Borno State born Port Administrator attended University of Maiduguri and Bayero University, Kano where he bagged Bachelor of Science Degree (B.SC.) in Geography and a Master Degree in Land Resources respectively. Happily married with children, Aliyu Goje also attended several Management courses within and outside Nigeria, among which are Port and Shipping Management, Logistics, Transportation and Port Training in New York, a performance culture in a concessioning system, South Africa, Strategic Management and Policy etc. In an interactive session with the officials of the division, Abdullahi Aliyu Goje called on everyone to key assiduously into the current Management thrusts which is anchored on “Excellence of Service” prioritizing a most “effective synergy with team work as our theme”. According to the new image maker, result is key in the activities of the divisions which he stated must be geared towards the NPA brand appreciation through commendable information Management and dissemination. “I have high hopes we will deliver on our targets and responsibilities. He said “As professionals, we have to tinker the best way to ensure we sustain plausible publicity mileage for the NPA Management utilizing technology and Innovation. This way the Organisations Vision, Mission and Values essence would essentially be upheld to the appreciation of both Stakeholders and the public at large. Goje further urged the divisional staff to brave up towards imbibing service excellence in tandem with International best practices whilst enlisting the collaboration of the entire organisation in this very auspicious task of perception Management.